The home for the podcast in which I force my father to read and discuss comics with me, he hates them but I force him by offering treats thus he surrenders! 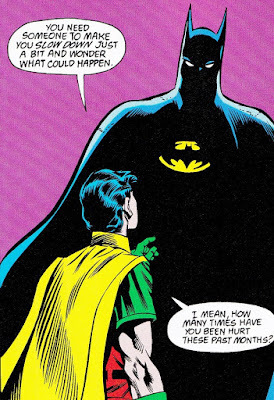 Patrick is joined by Randy and Jesse of the Grawlix podcast to discuss the seminal Batman tale from Marv Wolfman, George Perez, and Jim Aparo. The story as a great microcosm of Batman & Robin, and the fanbase. We discuss the change in tone for Batman that was still straddling the last vestiges of pre-Crisis Batman in 1989 and still not quite into the arena of Frank Miller's Dark Knight and Year One level Batman. Treat this week was some random left over cookies from the wedding that Patrick ate pre show. Dad is on the mend and thanks for the emails. Patrick Corcoran. Simple theme. Powered by Blogger.